Today I welcome author, Devon Monk. She is here to share a chapter from her online-only novella, Hang Fire. Devon writes the Allie Beckstrom urban fantasy series, the Age of Steam steampunk series, and the occasional short story. She has sold over fifty short stories to magazines and anthologies in five different countries, including a Year’s Best Fantasy collection. When not writing, Devon is either knitting strange things, remodeling the house-that-was-once-a-barn, or hosting a family celebration. HANG FIRE is a steampunk short story set in late 1800’s America. It takes place between the Age of Steam book #1, DEAD IRON and book #2 TIN SWIFT. The story is broken into 20 “chapters” and posted, one chapter at a time, on 20 awesome blogs. To read the whole story, start at chapter 1 at www.candacesbookblog.com and follow the “read the next chapter” links at the end of the post. GIVEAWAY: One luck commenter will win a special prize put together by Devon and the folks at ROC/Penguin Publishing. Details are at the end of the post. The only problem Cedar had was his brother. Wil limped out and stood in front of him, telling him by the lowering of his ears and hunch of his shoulder that he was not going to let Cedar hunt the gunman. Cedar scanned the trees where the shooter should be. He didn’t see anything, but he heard a cracking of underbrush and the distant rhythm of horse hooves fading off. Was the shooter riding off? He supposed it was possible Rose had hit the gunman, though Cedar didn’t smell blood in the air. It was possible the man had tired of trying to shoot them. The curse put Wil in wolf form for much longer stretches than Cedar. And while the curse carried a much quicker healing time, Rose was right. Wil would not be able to run out of this forest on his own. Cedar slung his rifle on one shoulder then bent and picked up the wolf, muscling him across his shoulders. Wil whined, but didn’t struggle. They made their way quickly out of the trees, Mae and Rose in the lead, both with guns drawn. “Hold up there,” a man’s voice called out. Both women pivoted, guns aimed at the speaker. Bryn Madder, one of their traveling companions, stopped dead in his tracks as a man who was staring down two barrels ought. The monocle over his bad left eye glittered ruby in the overhang of shadows from the trees at the forest’s edge. “Trouble I should know about?” he asked calmly. The women lowered their guns and Cedar strode out of the trees. Bryn Madder spent no time arguing. He had gathered up all their horses, including Rose’s that must have run off a ways. The big wagon that the other Madder brothers were traveling in was just on the other side of the river. “Can he walk, Mr. Hunt?” Bryn asked. Must have been the look in his eyes, or maybe the growl in his voice that kept all three people from arguing with him. The water was cold, but did a world of good clearing Cedar’s head. He crossed the river at the shallowest point, water up to his knees. Wil held very still. They made it to the other side quickly and safely enough. Though Cedar expected a gunshot at any moment, it never came. Why? Why would someone so set on taking shots at them suddenly ride off? Had Rose trespassed, and now that they were across the river, the shooter was uninterested? Or was the shooter riding ahead, setting up an ambush? The beast in his bones stirred. He knew this wasn’t the end of it. Someone didn’t waste that many bullets and not want to see the job finished. Rose and Mae helped Cedar get Wil into the back of the Madder’s big wagon, and then Cedar swung up onto his horse. “Not so bad a place to stop for the day,” Alun Madder, the eldest of the brothers noted from the driver’s seat of the wagon. “We’re not stopping here.” Cedar’s answer was short, but then, so was his temper. He wanted as far from this place as they could go. And quickly. He’d need to find a defensible position before the sun set. Before he could start on the trail, the wind shifted. And brought with it the sound of a rider. 3. 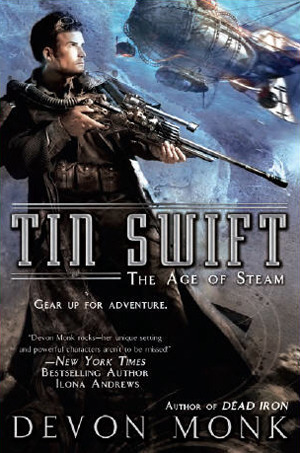 A magnet of the cover of TIN SWIFT. To enter, leave a comment telling about your favorite steampunk book/series or author. (Note: reading steampunk is NOT a requirement for the contest.) And while it is not a requirement, being a Google Friend Connect is always appreciated. Please leave your comments by Wednesday July 18, 2012, at 10:00 PM EDT to be eligible for the contest. There is one (1) winner. One entry per person, the winner will be selected from eligible entries using random.org. Contest is open to US mailing addresses only; please leave your email address so I may contact the winner. Prizes will be mail by publisher; I am not responsible for items lost in the mail. AND… Be sure to stop back later today to read B’s review of Tin Swift! Meljean Brook’s Iron Seas series is one of my favorites. Thanks for the giveaway! Gail Carriger’s Parasol Protectorate is the only steampunk books I have read, but those are fantastic. Can’t wait for the end. Thanks! Let’s go with one of the originals. H.G. Wells’ The Time Machine. Both the book and the movie are wonderful. Devon Monk is my first foray into steampunk so I’ll stick with her. Thanks for the giveaway! I know it calls itself ‘Gaslight Fantasy,’ but GIRL GENIUS will always be my first steampunk love. I’ve enjoyed quite a few great steampunk books, but I think I’d list Meljean Brooks Iron Seas series as my favorite, although Gail Carriger’s Parasol Protectorate is definitely a close second. I’ve read Dead Iron and I really enjoyed it as well, I can’t wait to read Tin Swift. I don’t read a lot of Steampunk, but aside from Devon’s works, of course, I’ve also really liked Cherie Priest’s Clockwork Century series. So far the Age of Steam series is the only steampunk I’ve read and I really enjoyed it. I think I’ll have to check out some other authors to get a better feel of the genre. Hm, favorite steampunk… most of the steampunk I’ve read/watched are manga/anime or children’s/YA… I guess Meljean Brook’s Iron Seas then. I like lots of them: George Mann, Mark Hodder, Phil & Kaja Foglio, Gail Carriger, Maljean Brooks and Devon Monk to name a few. Thanks for the giveaway and the story! I am a big fan of Gail Carriger’s series also! Brook’s Iron Seas is my favorite Steampunk series. Hm…I’d have to say Pip Ballentine and Tee Morris’s The Ministry of Peculiar Occurrences series! I love Pip’s writing! i like Gail Carriger’s series, and i’ve just read The Unnatrualists by Tiffany Trent. i loved Dead Iron as well! I liked Anno Dracula by Kim Newman. My first exposure to Steam Punk.